Best of Cat Health < Seven Steps to Fight Fleas on Your Pets – and Win! Fleas are no fun! Many of us get a bit overwhelmed when these annoying little bugs pop up, but as long as your puppy, dog, or kitten is older than seven weeks (and not sick and doesn’t have stitches so can be safely bathed), certain strategies can help you safely get rid of fleas. Here are seven steps that we’ve found useful in eliminating fleas even on super flea-infested puppies, dogs or kittens. Note: We can’t say we’d suggest trying this bathe and soak method on an adult cat, however! For adult cats, or other pets you can’t bathe, simply skip step #2. To make these steps easy to follow, we’ll call your pet “Fluffy.” Also, please check with your vet before trying any of these steps on your pet. Contain Fluffy in a room (like the bedroom) or crate. Super-clean a ‘holding’ room (not the same room with Fluffy in it), ideally with a hard floor, like a 2nd bathroom, where you will not be bathing Fluffy, or the kitchen. Remove and machine wash any fabric items from the room like towels, curtains, rugs, in very hot water. Do this so, in step 4; you can put Fluffy back in a now flea-free holding room while you de-flea the rest of your home. Wet with water & super lather Fluffy up with lots of baby shampoo or Dawn dishwashing liquid and soak for up to 10 minutes – or less time if that’s all you both can stand it! Dawn is safe and non-toxic for dogs, cats, and most furry pets, even though it’s intended for dishes. It does have the potential to dry out your pet’s skin though, especially if you wash Fluffy on a regular basis, so it’s best not to overuse. Baby shampoo is better if you have it. 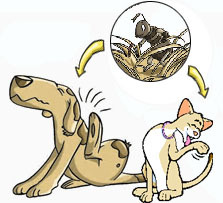 (We do not recommend a toxic “flea” shampoo, because we want to apply Advantage in step 6.) After you’ve let Fluffy sit in the bath a few minutes, go ahead and rinse, and watch the dead fleas go down the drain. If there are a lot of fleas, shampoo and rinse again until you see very few or no fleas when you rinse. Towel dry. Comb Fluffy with a flea comb. Start at the head and work your way to the tail. Have a dish of baby shampoo sitting on the side to quickly dunk and kill the fleas that you get with the flea comb. If Fluffy is still damp, gently dry his fur with a hairdryer set on low. Make sure the room is warm enough, so Fluffy doesn’t get cold. Small kittens/puppies may do best left with a warm water bottle under the flea-free, freshly-laundered towel you leave them on (monitor that they don’t chew it), or snuggled with a helper person. Ask your vet what flea control product they recommend for your pet. Some products require you wait 24 hours or more after a bath before application. For pets eight weeks and older, we like Advantage® II because you can apply it as soon as Fluffy is dry. Reapply as directed (usually monthly) so you don’t have to repeat steps one to six again! Vacuum rugs, sofas, curtains and hard floors. Dump your vacuum bag immediately in the trash –OUTSIDE your home. Wipe all hard surfaces with damp cloth. Repeat daily for the next week. Also, machine-wash anything you can (pet beds, your bed blankets/sheets) in hot water. When you’re done, you can let Fluffy out of the holding room! Repeat the super cleaning at least once a week, daily if possible, to reduce the chances of missed flea eggs hatching and the cycle starting all over again. We also find treating crevices, carpet, and fabric with food-grade Diatomaceous earth (as explained by a vet, here) can help tremendously with ongoing flea control. Fleas often mean Fluffy will also get tapeworms. Take Fluffy to your vet to get tested and dewormed within the next week or two, or sooner if you see the rice-like worm bits when they go to the bathroom, stuck to their fur, or in their bedding. These are our seven steps to a flea-free Fluffy and home. You can now enjoy your itch-free and healthy life together!